As I child I was mesmerized by the images of great while sharks on TV shows with Jacques Cousteau. So imagine my delight, many years later to discover several companies now offering great white expeditions into the blue abyss, allowing mortal men to come face to face with their childhood demons and creatures of fascination Carcharodon Carcharias. 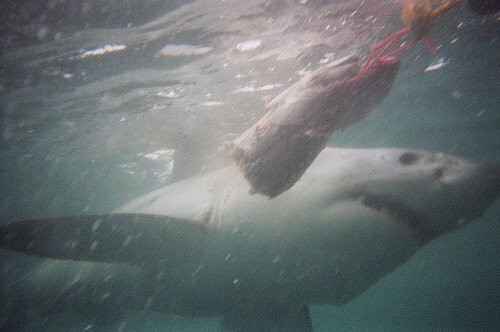 Diving in the waters known as shark alley, 160 km from Cape Town, South Africa. This experienced dive crew also offers surface viewing for those in your group that would prefer to admire these beautiful animals from the deck of a boat. even my brother every time returning back to Germany should back a big box.